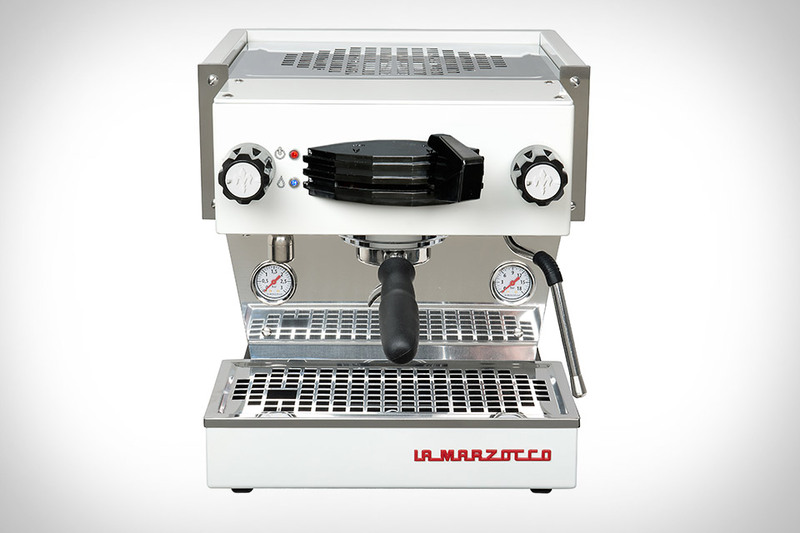 La Marzocco's Linea Classic is a favorite of numerous cafés all around the world. The La Marzocco Linea Mini Espresso Machine brings the same professional-level performance home in a compact package. It has a dual boiler system for optimal brewing and steaming, stepped temperature control, a self-contained two liter water reservoir, brew paddle activation with pre-infusion for consistency, and LED barista lights to let you focus on every cup. Available in four different colors — stainless, red, black, or white — to match any kitchen decor. Brewing the perfect cup of coffee requires precise control of many factors, including the water temperature, grind, time, and coffee to water ratio. The Auroma One Coffee Maker makes the process easy. It integrates the grinder, water reservoir, heating and brewing chambers all in a single unit, allowing it to control the entire process. While you can set each attribute separately, you can also just rate the coffee it brews based on factors like bitterness, texture, and kick, and it will automatically adjust the settings to fit your preferences while also recommending new beans from local roasters. It's as foolproof as it gets, short of just placing an order at the local coffee shop. Not too long ago, having stainless steel appliances in your kitchen was a big deal. Now, the Abimis Ego Kitchen aims to replace everything in your kitchen with the highly hygienic material. That includes all cabinets, which blend three types of storage — refrigerated, cool and room temperature — seamlessly, and remove all sharp corners, making them way safer. The high-thickness AISI 304 stainless steel countertops are perfect for both prep and presentation, and integrate gas, electrical induction and teppanyaki cooking stations, so no matter what the meal calls for, you'll be ready. It doesn't matter what you're cooking — the right dinnerware and table settings can make any food better. The Grovemade Tabletop Collection is a great example. This new offering includes ceramic plates, bowls, cups, and even salt and pepper shakers made by a local vendor, with a textured matte exterior and satin finish, and available in black or white, either of which looks great with the wooden accessories. They're made with domestically-sourced walnut and maple, hand-sanded with an oil finish, and include items like placemats, coasters, a trivet, and a salt cellar. Crafted entirely from high-gloss, medical-grade stainless steel, the Iikone Coffee Brewer is as much a sculpture as it is a functional addition to your kitchen. Thanks to its unique, spider-like design, it's the only brewer around that doesn't obstruct the filter, resulting in tastier, less bitter coffee that's even more complex than what you'll get from a traditional pourover. It comes packaged in a hand-made wooden case, and is compatible with most 6-10 cup filters. Brewing your own beer at home isn't overly difficult, but it can be intimidating if you haven't done it before. The MiniBrew is an at-home machine that makes brewing beer nearly as simple as brewing coffee. This all-in-one machine brews and cools the wort, then automatically transfers it to the yeast unit to ferment. 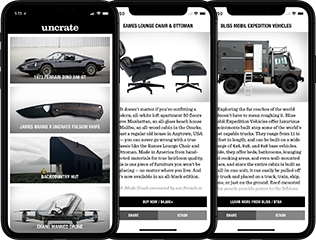 It automatically controls the fermentation process, so it's easy to reproduce your favorite batches, and the app will also let you discover new beers and order ingredients, so it's equally as easy to try new recipes, five homebrewed liters at a time. Temperature. It's a vital component of every hot beverage we consume. And until now, it's been incredibly difficult to regulate. The Ember mug provides the perfect vessel for consistent drinking temperatures for your coffee or hot tea — and will keep it that way for up to 2 hours. When coffee is ready, it's usually too hot to drink, and when it's ready to sip at the perfect temperature, it doesn't stay there very long. Ember cools things down to the ideal temperature without the need for complicated buttons or instructions, just rotate the dial at the bottom to set the temperature and enjoy. It's leak proof, portable, and easy to charge using the slim, compact coaster. You can even pair via Bluetooth and adjust the temperature using your smartphone when your Ember isn't at arms length.